Usually I’m not the type of girl to book an organised holiday in an all-inclusive resort. I literally cringe when typing the word 😀 But that year I made an exception. 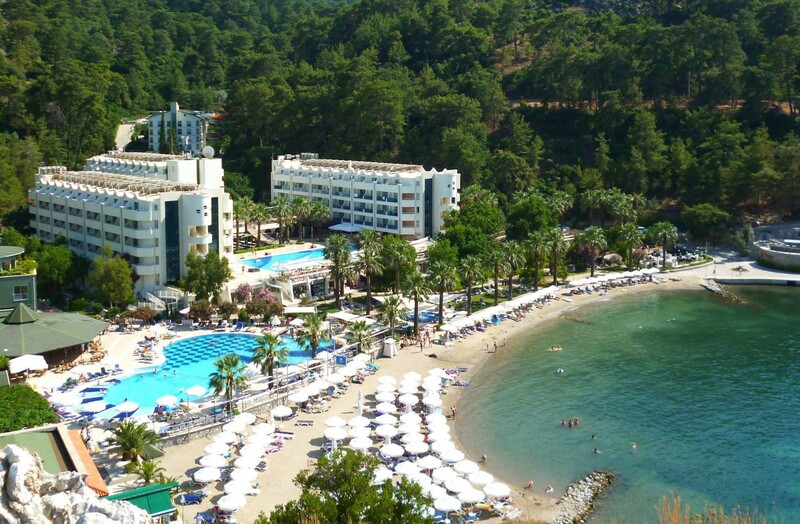 Everybody who has been to Turkey will know it’s hard not to stay in an all-inclusive resort. Even though I decided to stay in an all-inclusive hotel, that didn’t mean I would give up all my principles. I decided to book ten days in this all-inclusive resort in Turunc and then end up five more days by ourselves in Dalyan. Turunc is a small village at the coast near the Aegean Sea. Close to major tourist cities like Marmaris and Icmeler. The hotel I stayed in was the main hotel in town “Otel Turunc”. It is situated on a private beach in a beautiful bay. The staff was friendly, the food was great and the entertainment was good. Just perfect for a week away. The center is small and cosy with only a few restaurants, bars and terraces. From the harbor in Turunc you can get a taxi boat to Icmeler and Marmaris if you’d like to visit all the crowded places. I think it’s about 15 lira return ticket per person. Tip! When you’re hungry for a snack or a light meal, go to town and visit Izmir Kumru. They sell amazing sandwiches with different kinds of meat on it. It’s a small place with a couple of tables outside. They also sell ‘midye’ (stuffed mussels). It was my first time eating them and they are so good. They are stuffed with rice, served on a plate (you pay per mussel) and you put some fresh lemon juice on them. Absolutely lovely! So, after a week we left Turunc to go to Dalyan. Dalyan is also a small town almost straight across the sea from Turunc. I found out that going by bus or car would take us more time than going by boat. In the harbor there are many places where you can book a group excursion to Dalyan. I decided it was easier booking this excursion and end up staying in Dalyan. We even got a discount, because we didn’t take the boat back to Turunc. This group excursion took us to a natural mud bath and then through the rivers to Iztutu beach. Iztutu beach is also called turtle beach. It is actually a beach where sea turtles lay there eggs. Therefore the beach is only open between certain hours. There is also no sewer system on the beach. In the restrooms everything is done with salt water. So don’t fill up your water bottle. You’ll be disappointed 😉 There is also a turtle rescue place, where you can visit the turtles who are sick of have been hurt by the nets by fisher boats. The entrance is free. Dalyan is a beautiful little town. There are many places to eat. I booked a basic apartment through Booking.com. It was extremely cheap. The apartment had one bedroom and a small kitchen. Everything was very basic, but perfect. The location was good and the owner was helpful and friendly. After some hesitation from me, I agreed to rent a quad. It is so easy to go for a drive. There are so many beautiful remote beaches. Just follow the main road across the small lake “Sulungur Golu”. And if you’re going through the mountains. Bring a small Turkish translation book with you. In case you need to ask for the way home. People do not speak English. You can even take the quad from Dalyan to Iztutu beach, which is around 30 minutes away. You can also go up and follow the main road around the big lake “Koycegiz Golu”. Take a map with you and drive up to Yuvarlakcay, which is a stream up in the mountains with some nice restaurants nearby. 2. There is a another restaurant on that same road. It’s located by the river and you get to feed little turtles. I really loved the food and the surrounding of the restaurant. Check out their website on www.golbasi.com (in English as well!). If you’re not sure what to order from the big menu, the “kuzu guvec” and the “sac kavurma” are highly recommended. What is your favourite place in Turkey? Let me know in the comments below!